A major redevelopment of one of the West End's most popular squares could turn it into a continental-style piazza. Westminster City Council wants to knock down and rebuild one side of Leicester Square to include pavement cafes, theatres and more cinemas. There are already plans to transform the Hippodrome nightclub's site into shops, restaurants and offices with a smaller club. At the other end of the 'north terrace', there are proposals to redevelop the Swiss Centre. Now Westminster hopes to persuade the companies which own the properties in between to form a holding company to redevelop the entire block. "It's a great opportunity now to make Leicester Square really exciting and special for the future," council leader Simon Milton told BBC London. "We keep the place clean and keep the lid on crime but just managing it is not the same as changing it." Up to 250,000 people use or pass through the square daily, but critics say it can be intimidating at night. 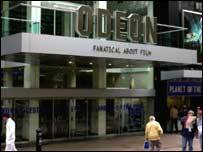 The council wants to use the Odeon cinema, which hosts film premieres and the BAFTA awards, to promote the square as the home of cinema in the UK. It will encourage more family films and events for children to entice them to stay on in the square into the evening. The gardens in the centre of the square, currently closed at dusk, will be redesigned or even scrapped. But restaurateur Nissim Levy says there is no need for change. "Leave it like this, it's nice, "he told BBC London. "Four or five buildings here all have different landlords. I don't think they'll ever agree. It will never happen." The council hopes that its measures will eventually turn Leicester Square into a welcoming, clean and secure landmark in the West End. 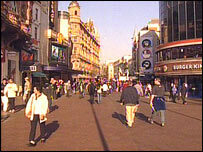 "Late night drinking and the sheer numbers coming to Leicester Square have exposed its crime problems."